"This is the use of memory: For liberation not less of love but expanding Of love beyond desire, and so liberation From the future as well as the past." - T(homas) S(tearns) Eliot, Four Quartets,'Little Gidding', pt.3. Aum Tare Tutare Ture Soha and Aum Sri Shanaishwaraya Swaha are sound-based salve for the wounds that cry out to be seen and heard. In a partnership of Yin &Yang – each of the two mantras sets out to soothe adhesions at root levels to make space for other options. They verify the need for requital in a process that works from the inside out. Through validation of hurt we vanquish holding patterns. We learn to forgive and move forward with less burdens and more victories. As a salutation to Tara, “she who saves”, Aum Tare Tutare Ture Soha, speaks to the heart of the matter -- soothing aches with unyielding kindness. It is believed that a single tear from Avalokitesvara (the Bodhisattva who embodied the compassion of all Buddhas) created a Lake of Compassion. From these waters of forgiveness, Tara, known as “The Mother of Liberation” arrived on the throne of a lotus. Stepping from this ceremonial occasion, Green Tara became a forest goddess with down to earth powers of comfort and clemency. Tara, often translated as star, is a shining light and beacon of hope for the disenfranchised elements within. Aum Sri Shanaishwaraya Swaha is a riddle onto itself - tough to say and even tougher to live. In Sanskrit, Shanaish refers to the slow moving Saturn who was born of shade and sun as the mythical son of Lord Surya and wife Chayya, Paying homage to the spirit of Saturn, the planet of lessons, these beguiling sounds go straight to our bones to dissolve ancient bruises. The sixth planet from the sun teaches us how to S.implify P.olarities A.nd C.ontract/E.xpand (Space) at a methodical pace to engender more peace in the space between the opposites. Healing Mudra (also known as Aakaash-Vardhak Mudra) is a detoxifying gesture that amplifies opportunities for space in the body. When the middle finger (associated with Saturn) connects with the thumb (associated with Venus) – we establish a pipeline between our life lessons and the L.aw O.f V.astnes E.xpressing (Love). Middle finger and thumb align with the palm chakra - hovering above the eyes of the felt sense like a halo of grace. From this position of unity, the index fingers act as channels reaching out into the expanse. Poised as partners, the baby and ring fingers funnel in wisdom and clarity as if collecting shells at the shore. Trust in gut instincts – but what does that mean? Where is this place that is widely revered as a primordial guide? What do the sensations say? How do we know how to translate their message? As we embrace the viscera- we embark upon a journey—spiraling inward to discover the source of wisdom that informs our every move. Friction hands briskly (Purposeful Fidget F1) for 60 seconds. 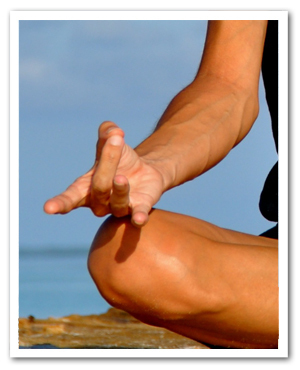 Take Healing Mudra: Join middle finger and thumb pads directly above the palm centers. Stretch long through index finger and seal the medial line of the baby finger with the lateral line of the ring finger as if binding them together to create a reception vessel. Place hands palms up on inner knees. Seated tall – eyes closed – chant Aum Tare Tutare Ture Soha 28x. Then Chant Aum Sri Shanaishwaraya Swaha 8x while visualizing an infinity symbol in the mind’s eye. Now, ly down on the back -- head support by a pillow, bolster under knees -- and place hands the right hand on the belly and the left hand on the heart. Breathe deeply and invite healing and rest. 3-5 minutes. Texturize the breath and stretch intuitively as if waking up from a long nap. Initiate a few big yawns and sighs. Bring knees to chest. Usher in a spirit of alertness.